Scottish Canals commissioned these interlinked modular units at the Kelpies, near Falkirk and Grangemouth. 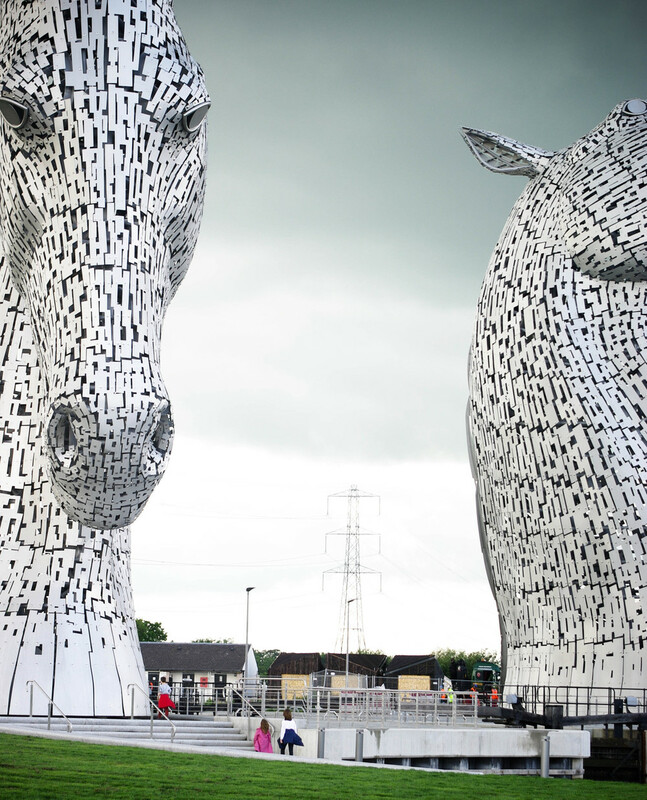 They provide visitor facilities at the very north end of the Helix - the new 300 hectare park that includes woodland, paths, cycleways, water features and two thirty metre high equine sculptures by sculptor Andy Scott. In a similar fashion to the design for the camping cabins proposed for the Caledonian Canal, the units are fabricated entirely off-site where they can be built under controlled conditions. This allows work to continue in parallel whilst the site is prepared enabling an accelerated construction programme. Intended as a temporary facility, they can be individually lifted by a lorry-based crane and re-fitted as canal camping pods at a different site, if needs be. Designed around the optimum size and weight parameters for road haulage, these cubic units gain a distinctive identity by a simple turn of the roof’s pitch along a diagonal line and by cladding them in Scottish larch which has been charred. We see this project as an evolution of our practice’s first commission in 2000 for a finely crafted timber sleeping unit called Bed Box. That project was inspired by a painting of St Jerome in his study that epitomises the space required for solitary occupation and reflection. This recent commission has allowed us to develop other narratives and interpretations as it has consolidated into an archetypal shelter that can house a whole variety of uses.